President Trump’s latest tweets on U.S. diplomacy with North Korea appear not only to undermine Rex Tillerson, his secretary of state, but also the nascent dialogue with Pyongyang over its nuclear and missile programs. One could say the president’s remarks Sunday are an unprecedented undermining of his own secretary of state. Except they are not. 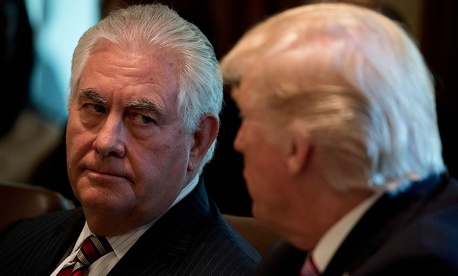 Trump has done this before, on several occasions: This summer, as Qatar was accused by its Arab neighbors of, among other things, supporting terrorism, Tillerson urged “Saudi Arabia, the United Arab Emirates, Bahrain, and Egypt to ease the blockade against Qatar” and urged Doha to be “responsive to the concerns of its neighbors.” Moments later, Trump, with Tillerson sitting in the front row, called Qatar “a funder of terrorism at a very high level,” stunning diplomats. What the tweets will almost certainly do is undermine Tillerson and U.S. diplomatic efforts, given that they came a day after the secretary of state said in Beijing that the United States has “three channels open to Pyongyang.” Tillerson also said the U.S. was talking to North Korea “directly” and not through China, which the secretary of state is visiting to, among other things, shore up diplomacy on North Korea. Personnel issues aside, Tillerson’s critics say that in the absence of strong U.S. leadership on foreign-policy issues, other countries, notably China and Russia, are trying to fill the void. That’s certainly true on North Korea, where China, by far its largest trade partner and its major political ally, has emerged as pivotal to any diplomatic solution. While the U.S. and China agree on the need for a denuclearized Korean Peninsula, their prescriptions of how to get there vary. Any resolution will almost certainly take those differences into account. The tweets could also prompt the North Koreans who are talking directly with the United States to ask whether there’s any point to the endeavor. They are dealing with their own unpredictable leader, one prone to brutally executing rivals on a whim. If those efforts come to naught because the U.S. isn’t serious about them, they might ask, is North Korea right to pursue a nuclear and missile program as a deterrent? There is, of course, the possibility that Trump perplexes the North Koreans into diplomacy. Until Trump took office, Pyongyang has been used to the traditional practice of diplomacy, and has reportedly sought meetings with Republican foreign-policy analysts to gauge what the president is thinking. American reporters who have recently visited the country also have said their North Korean interlocutors want to know if Trump wants war. That sort of unpredictability is exactly what proponents of the “madman theory” say will force North Korea to talk to the U.S., but as my colleague Kathy Gilsinan wrote, Kim himself is an unpredictable leader.